We get a ton of questions about who qualifies for an account with us, where we ship to, etc. This post will cover some of our top frequently asked questions and will break down all the things you need to know about purchasing wholesale blanks. You can also check out the video below! How can I Buy BELLA+CANVAS? One of the most common questions we get is, how do I purchase BELLA+CANVAS? The main method we recommend is to purchase BELLA+CANVAS through one of our wholesale partners. A wholesaler is basically a distributor of our BELLA+CANVAS product along with other apparel brands plus bags, accessories etc. The great thing about ordering through a wholesaler, is that they have warehouses all over the country that are deeply stocked in inventory, this can reduce shipping times and costs. Also, most of these wholesalers offer freight incentives! Not to mention, these companies have great sales support and can help you with recommendations and other information. Check out the list of who carries BELLA+CANVAS HERE. You can also purchase certain products through bellacanvas.com. In particular, this gives you exclusive access to all our Fast Fashion styles where we’re launching something new every month, so having an account with us will keep you up-to-date. It’s also great for those you who are in the L.A. area, we offer free pickups right at our headquarters. We also have no minimum requirements when shipping within the U.S. The third way is to order through a decorator. Meaning either an on-demand print service, like Printful or Custom Ink, or a full package screen printer or embroidery shop. These are all great options, especially for anyone who isn’t a printer and wants a one-stop shop. Just make sure to ask for BELLA+CANVAS to view our products that they offer. Where’s the Best Place to Purchase BELLA+CANVAS? We commonly get asked, what’s the best place to buy BELLA+CANVAS? For qualified resellers, is it better to buy from a wholesaler or through bellacanvas.com? As we touched on earlier, if you qualify, we highly recommend going through one of our wholesale partners. They’re generally your best bet because of freight incentives and have a national reach through multiple warehouses across the country. If you are looking to access our Fast Fashion collection, you’ll want to set up a direct account as well. But what if you aren’t a qualified reseller? For those of you who are on the smaller size, looking for about 200 units or less, full service printers are going to be your best bet. We recommend working with a printer who offers full package support – who can order BELLA+CANVAS products, assist with design needs and even offer shipping and fulfillment. Do I Qualify to Buy Wholesale? Let’s talk a bit about how to setup an account with BELLA+CANVAS. It’s easy to forget that we are a wholesale brand. But because of that, there are certain qualifications you need to meet in order to set up an account with us. DECORATOR: This includes contract and full-service screen printers or embroiderers and means you typically print large volume orders. When approving applicants, we look for indication that you own and operate your equipment. DISTRIBUTOR: This includes promotional product distributors. If you have an ASI or PPAI number, you’ll likely qualify under this category. BRAND: This includes licensed clothing brands with proof of website, ecommerce presence or retail locations. After you apply for an account on bellacanvas.com, you’ll need to provide a valid resale certificate for all states in which you conduct business. Don’t have a resale license? Every state is different, so make sure you research what qualifications your state requires. So what if you don’t fit into those three categories and you don’t qualify for an account, for example you are a fitness gym or etsy shop, how else can you get BELLA+CANVAS product? You can get it through any qualified apparel wholesalers such as Alphabroder and S&S. Contract and full-service screen printers, such as Shirt Agency or Deluxe Screen Printing. And finally, Promotional Product Distributors. Be sure to contact customer service at sales@bellacanvas.com if you have any inquiries about whether you qualify or how to create a direct account. We do want to make it clear that we are a big supporter of small businesses, even if we can’t sell directly to you guys. As we mentioned earlier, it’s actually more beneficial for you to go through a full service printer so you can get that full package support – meaning they will be able to help you from the ground up. If you’re looking for decorators in your area, email sales@bellacanvas.com, and we can send over some recommendations. 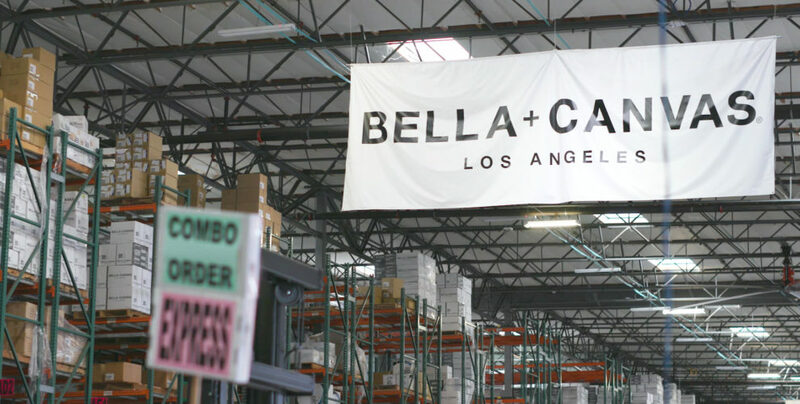 BELLA+CANVAS ships to anywhere in the U.S., except PO boxes. We ship internationally only to Canada, Australia, New Zealand and Puerto Rico. Please keep in mind all international orders must be ordered in full cases. Typically, a case includes 72 pieces of one style/color and size, but units can range between 12 – 96 per case depending on style and sizes ordered. How do I locate a Specific Style? Looking to find out how much stock we have or if a style is sold out? We have a Product Locator on our website under the Resource tab. Once you’re there, you can filter by style, color and wholesaler to help you find the stock closest to you. Cut-off time for ground shipments is 4pm PST and for same day/express shipping, it’s 2pm PST. Typically, orders can be processed within the same day that the order is placed, but it really depends on how large the order is. For example, our cut off time is 4pm PST, but if you place a 5,000 unit order by 3pm PST, the order might not be able to be picked and processed until the next day. That’s why we usually allow for 1 – 2 business days for orders to fully process. FedEx is our carrier of choice, but feel free to provide your preferred carrier account number at check out. You can also reference our full list of FAQ’s on our website HERE. And never hesitate to reach out to us! Check out ways to connect with us HERE. Happy shopping!